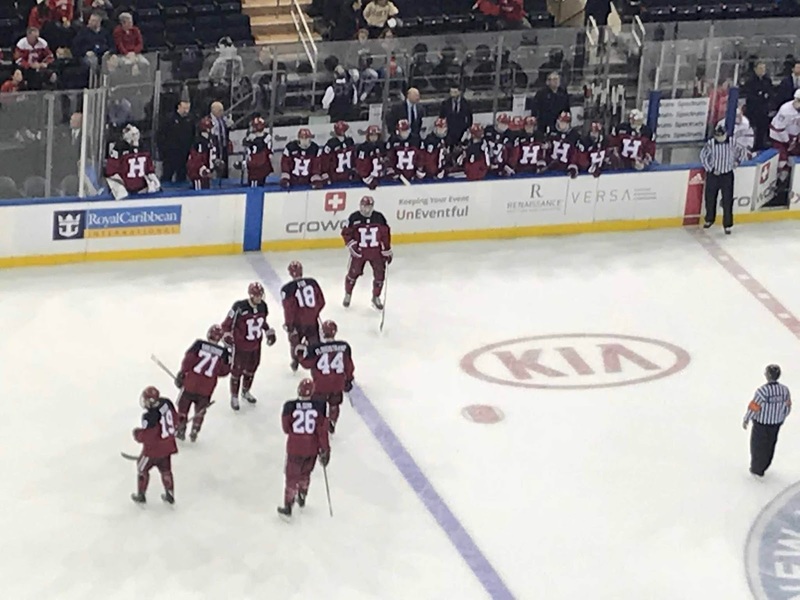 Harvard celebrates a late goal. Photo by Jason Schott. One of the annual traditions at Madison Square Garden is the Frozen Apple, the college hockey game held the Saturday night of Thanksgiving weekend. This year's event featured Harvard taking on Cornell, and in front of 14,132, it was Harvard who came away with the 4-1 win. Cornell got on the board first when Liam Motley scored 6:55 into the game on a blistering slap shot. Alec McCrea and Beau Starrett got assists on the play. This was Motley'd first goal of the season. It stayed that way into the second, when Harvard tied it 3:20 into the frame on a goal from Lewis Zerter-Gossage, his sixth of the season. 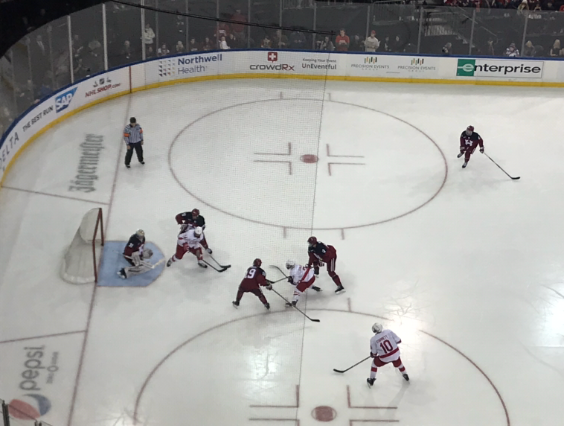 Henry Bowlby gave Harvard a 2 -1 lead with 10:14 left in the second, and he put the game away when he scored with 6:02 left in the third period. Bowlby had just one goal in four games this season before his breakout performance. Casey Dornach assisted on each of these goals, and his three assists give him 10 on the season. Adam Fox got an empty net goal with 1:10 remaining to seal the victory for Harvard. Harvard goaltender Michael Lackey earned the win in net, as he made 30 saves, including 15 in the third period. He is now 3-2-2 on the season. Harvard improved to 3-3-2 overall and 2-2-1 in ECACH conference play. Cornell fell to 5-4-0 overall, 3-2-0 in the ECACH. Harvard's Michael Lackey making a late save. Photo by Jason Schott.